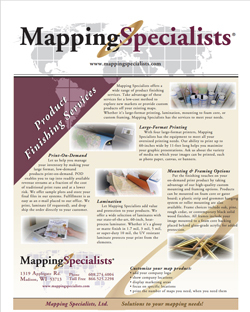 Let Mapping Specialists add value and protection to your products. We offer a wide selection of laminates with our state-of-the-art, 60-inch heat-process laminator. Whether it’s a glossy or matte finish in 1.7 mil, 3 mil, 5 mil, or super-duty 10 mil, the UV resistant laminate protects your print from the elements.